Entering the ring the all-new Pershing 5X may contend in the lighter weight division, but the entry-level yacht still floats like a butterfly, stings like a bee and proves to be yet another knock-out! Sporting fashion plates that have been developed into swept-back aerodynamic wings, now a Pershing leitmotif, an aggressively dynamic profile, swift rakish lines that exude a sense of speed even while moored to the dock and sculpted black glazing that slashes and crowns the sparkling metallic white hull, even before the first bell sounds there is no doubting this yacht’s pedigree. Available with two engine options– twin CAT 12.9 1,000hp powerplants hooked up to Top System 75X surface drives, or two IPS 950 Volvo D11’s producing 725hp each, with Z-drives and counter-rotating propellers – the unit we sea trialed was fitted with the latter, allowing useful helming aids like dynamic positioning, vector joy-stick, and the interceptor-technology auto-trim system to be installed upon request. As the skipper eased the yacht out of its berth we took a moment to check out the 5X’s aft section, which commenced at the stern with a fixed bathing platform, though a hydraulic version can be included that would allow for the carrying of a Williams 280 jet rib tender. With the tender launched and guardrails fitted, a neat seawater pool up to 0.6m deep is created for younger guests. Behind the transom plate resides a garage space for toys like SeaBobs, inflatables and a roll-up tender. On entering the cockpit, we’re delighted to see the ‘wings’ feature tinted glass inserts, thus affording further protection to the seating area without impinging on the lines of sight. 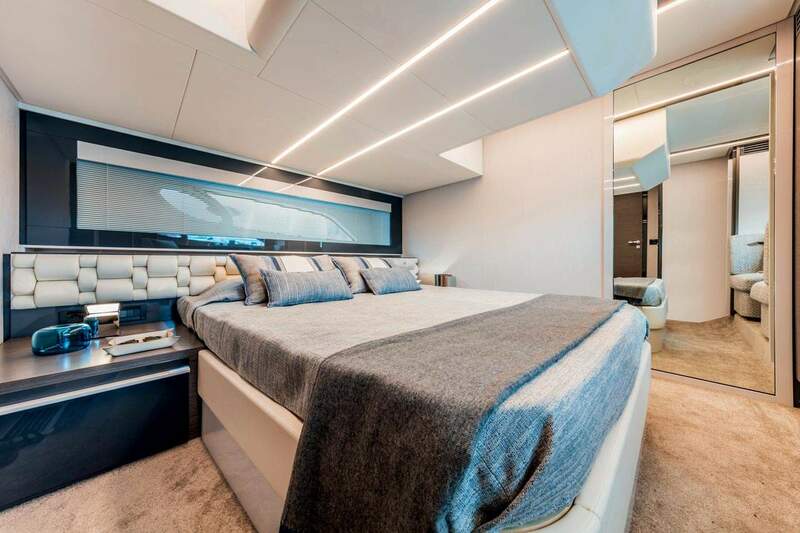 Over the transom a wide sunpad encourages lounging, while an L-shaped banquette wraps around the port side. The forward partition between the cockpit and the main salon proves to be another hidden delight, lifting up and over at the push of a button to provide that seamless interaction between indoor and outdoor spaces that so defines the Open genre. Taking full repose on the sunpad and settling into the cockpit sofa there was one issue we did discover that may require some addressing – there isn’t a place to set our glass between sips. There is a small refrigerator under the seat and the next one is in the galley on the lower deck to aid in the preparation of a timely tincture. Notwithstanding our earlier comments about little flaws in the funcionality of cockpit that are easily fixable, we must express just how impressed we were with the 5X overall. Inside, the main salon maintains the light and airy ambience of a glass bubble, with an opening glass sunroof overhead. 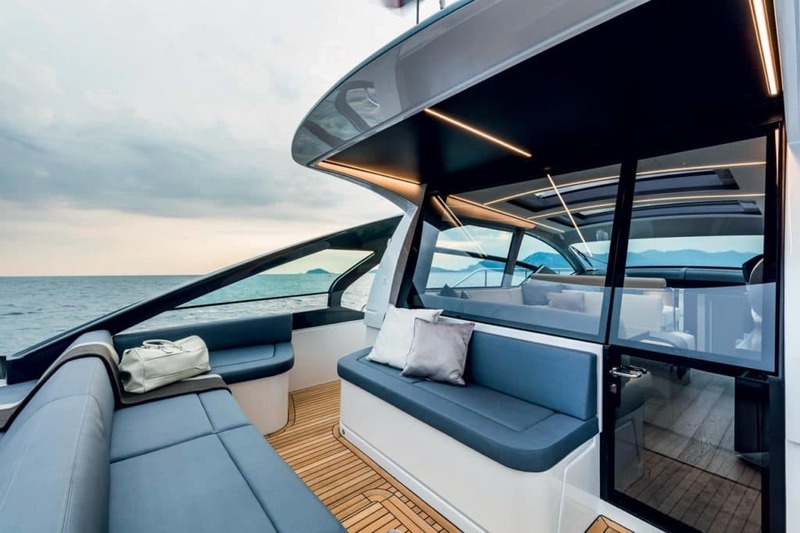 An optional extra retractable glazed panel can be fitted above the helm to further optimize the breezy nature of the salon. Descending the central companionway to the lower deck one finds a spacious full-beam master state-room athwartships, complete with en-suite. The designers have also allowed a pair of comfortable chairs served to a dinette. A VIP cabin is more generously appointed than one would expect. On the version we reviewed the portside dining area is served by an eminently practical galley to starboard, though there is the option with additional guest or crew cabin. Hurtling crisply over the azure waters, we swapped places with the skipper to put the Pershing 5X through her paces. Slow-speed maneuvering proved to be a synch, but it’s when the throttles are gunned and the fighter dances up onto its toes that the real fun begins. Crisp acceleration onto the plane with minimal bow rise characterizes the early charge for the horizon, before rapidly climbing up to cruising speed of 30-knots. Tracking surefootedly through turns and spins, the 5X then straightens to deliver its fast punch through to a 35-knot top speed. We did hand back the helm slightly ruing not being able to trial a unit fitted Cat engine installation. Topping out at 45-knots one feels the Pershing 5X would really deliver the true Pershing experience. To our mind the Pershing team have perfectly addressed the market they are seeking to attract: new coverts to the Open class, young families and couple who appreciate style, quality and performance.